Here at Northwest Career College, we think that it’s important that you have real world experience of how a dental practice works as part of your education, which is why we offer externships with all of our dental administrative assisting courses. Obviously, every workplace is going to be different, but if you’re considering a career as a dental administrative assistant we’ve put together a few general ideas on what it’s like to work in a dental practice. The work is fast paced – To fit in the maximum amount of time to provide treatment for each patient, dental practices normally run on tight schedules. While in a perfect world, every day would run exactly to schedule and every patient would show up for every appointment on time, in reality you’ll need to be ready to adjust the daily schedule on the fly and work with the rest of the staff to make sure that every patient gets enough treatment time without feeling rushed. The patients come first – While dental practices are fast paced places to work, there is one hard and fast rule for all of them. The patient always comes first. Dentistry can be a scary idea for some patients, so it’s important that, regardless of your normal duties, you make every effort to keep your patients calm, happy and feeling cared for. There is always more admin to be done – Dental practices thrive on efficient administration. Patient files need to be correct and up to date for them to receive the best treatment possible and it will be your responsibility to make sure this, alongside a number of other administrative duties, is done in a timely and detail-oriented manner. There’s always something new to learn – The field of dentistry, like every other medical field, is always advancing and it’s not just dental treatments that are changing. As healthcare moves away from physical records toward a more integrated and digitized future, dental administrative assistants will need to keep up to date with the latest advances in their field. 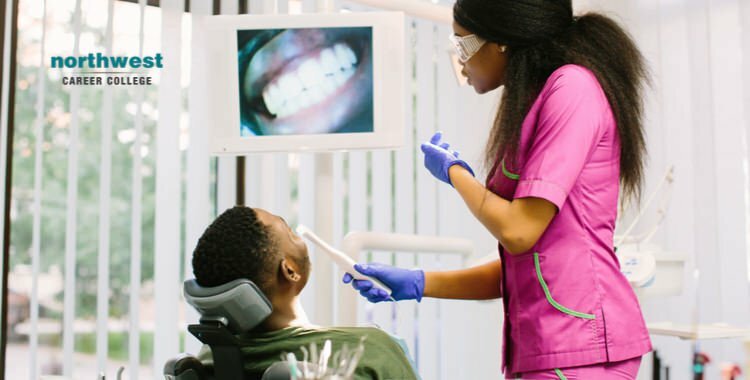 Employment for entry-level jobs in the dental field is expected to increase 23% over the next 10 years, faster than average for all occupations, according to the Bureau of Labor Statistics. With this growing demand for DAA’s, it is essential that graduates cultivate the skills and traits that will help them stand out in the employment market. Here at Northwest Career College, our Dental Administrative Assisting Program prepares students to work in any dental office. Our expansive, nine operatory lab provides students with a real-life dental office experience. You will be trained to handle clerical duties such as scheduling appointments, handling insurance claims, and monitoring inventory. You will work with documents, forms, and computer systems. No other Dental Administrative Assistant Program in Las Vegas offers this type of advanced training. Our student-focused approach will help you cultivate the skills you will need to stand out. Our experienced Career Services team will work with you to help you find the best dental administrative assistant employment opportunities in Las Vegas. Call one of our enrollment specialists at (702) 403-1592 to find out more.